It's official, I'm enchanted with the holiday season. I can't resist all the catalogs. With each turn of the page, I find something a little more enchanting. As I plan a gingerbread day, I decided to create a small unit to use for our learning. My planning became a way of channeling my excitement for the holidays. Thank you for all my loyal followers and those I've recently acquired. I enjoy reading your comments and seeing your feedback. As a thank you, I want to share my book companion! Click graphic above to access the freebie. 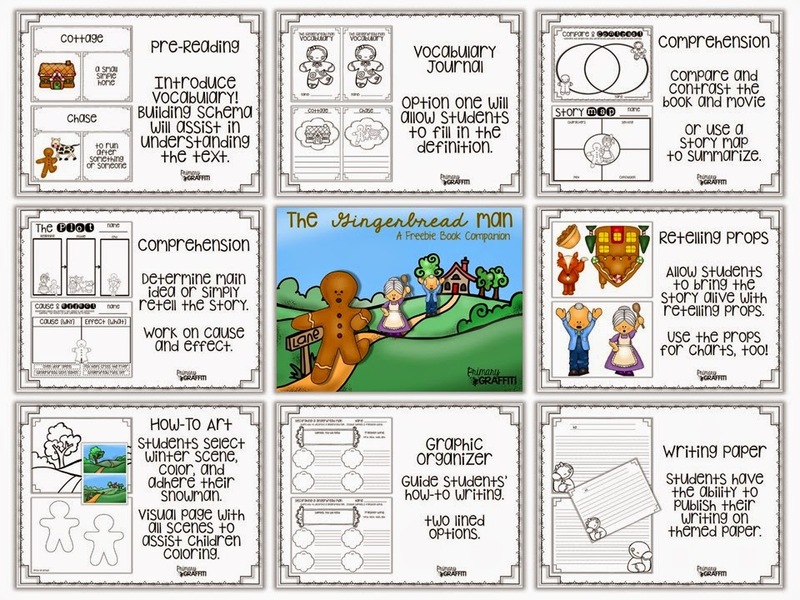 Click graphic below to display The Gingerbread Man. The best part about creating book companions has been pulling out all the treasured tales I use to teach my kids skills and concept while taking a deeper peek at the text. I'm going to share how I plan to use this unit. 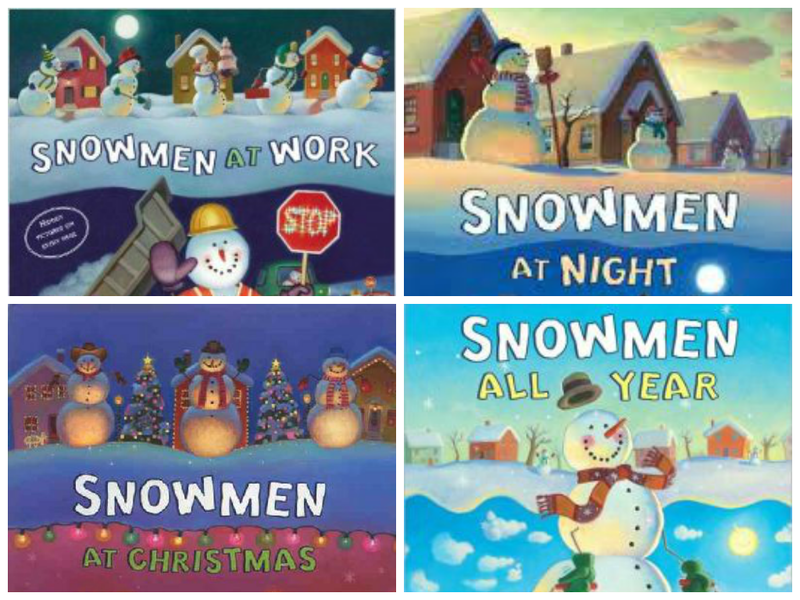 Begin building background knowledge with the topic of snow. Record information gathered in a KWL. An alternative is to discuss snowmen with a Have, Can, Are chart. Throughout the week, keep track of details from each story with a matrix. The matrix will be a large component of learning on Thursday and Friday. Building vocabulary background each day will assist your language learners. The format remains the same for each book: vocabulary poster, student journal, and interactive page to save on copies. An additional blank card is available and made editable. I decided the book Snowmen All Year didn't have the depth of vocabulary and opted to review the matrix by Friday. Reread the story to assist in reviewing interactive skills pages. Included are essential questions, flip flaps for note taking, and a student page for informal assessment. Each of the above options are provided for rhyming and compound words. You'll find engaging comprehension response sheets for compare/contrast, story maps, plot, adjectives, making connections and a response to literature. Develop writing through the week with a fun published paper with a craftivity. Provided are poster images for a shared writing. 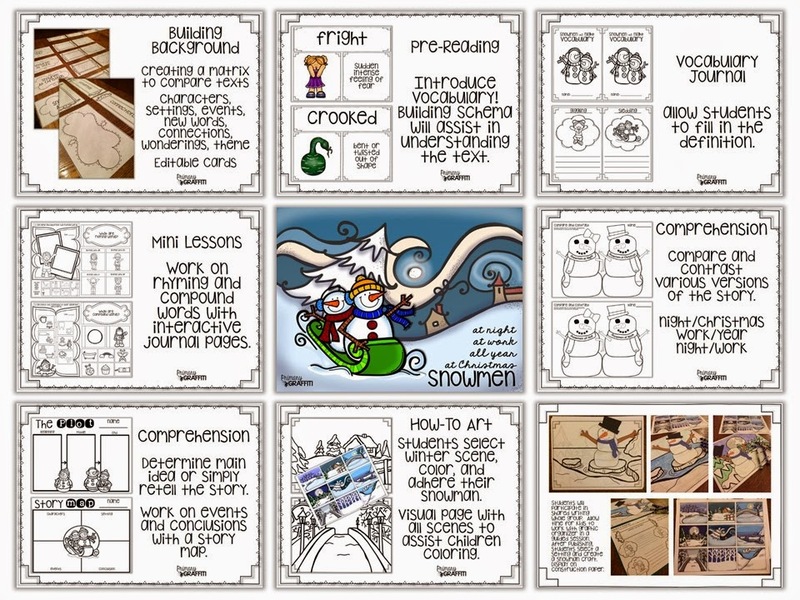 Depending on their background knowledge, I've provided images to create a functional story on How-to Build a Snowman and How-to Decorate a Snowman. If time provides or the following lesson, allow time for kids to work with graphic organizer. Optional writing pages for published stories or elaborating on the graphic organizer is found at the end of the packet. Follow up writing with a fun craft. Allow students to select a setting. A template on how to color the backgrounds is provided. Students will color setting, assemble and attach their snowman. You can link to my store by clicking the first and last image. The cover and preview have links embedded too! This weekend has caused me to feel a bit festive. We prepared our house for Christmas. It's a tradition to put up the tree and decorations the day after Thanksgiving but for medical reasons, I'm preparing for the madness two weeks earlier. During my down time, I've been prepping a New Years book companion. 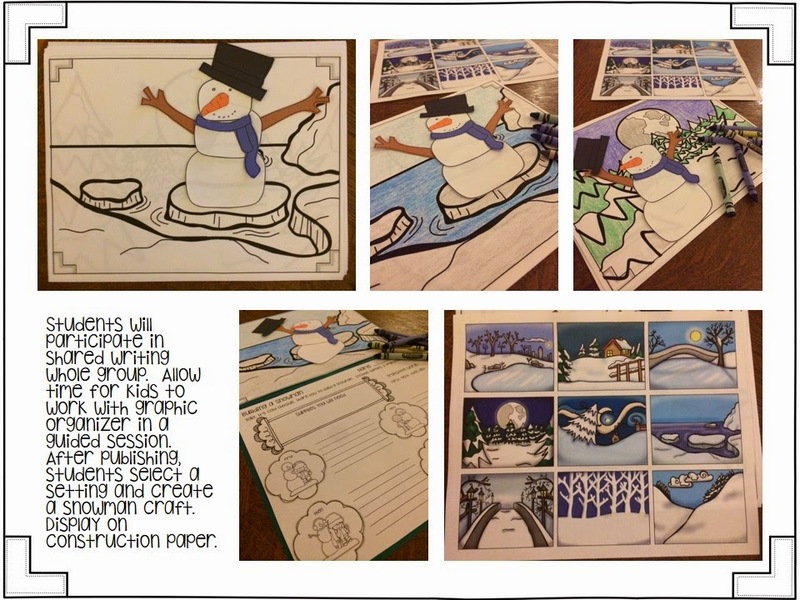 Captivate students with winter themed fun while meeting learning standards! This 80 page packet is packed full of excitement. Start your lessons with props and pictures so that your little learners activate their schema. 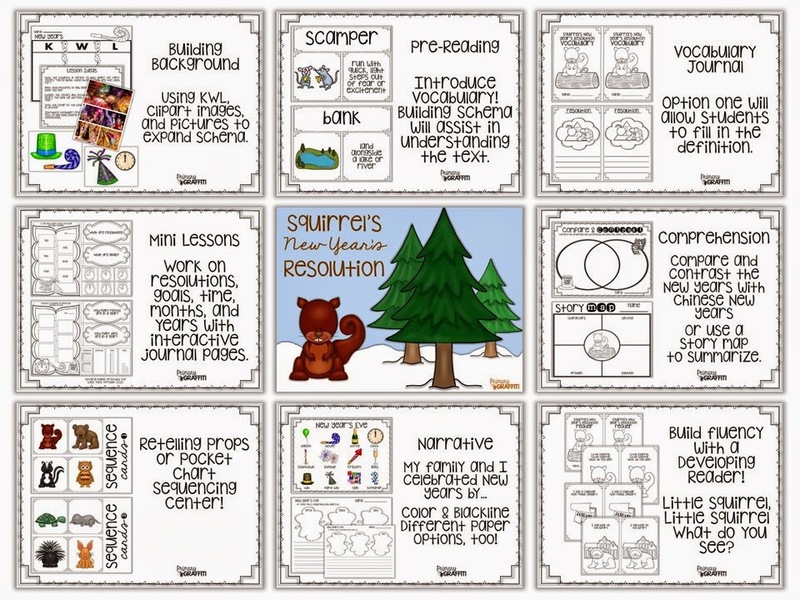 Build background knowledge of New Years with a KWL. A heavy dose of story vocabulary will assist language learners with words such as resolution, pinned, bank, scamper, spied, edge, stake, and grumpy. Provided are several options for recording vocabulary words. Option one includes a vocabulary book with clipart images. Option two includes blank vocabulary response pages. Reread the story throughout the week using my prepared interactive skills pages. Included are essential questions, flip flaps for note taking, and a student page for informal assessment. Each of the above options are provided for goals, resolutions, time, months, years, place value. You'll find engaging comprehension response sheets with a story map, compare/contrast, plot, and sequence of events. Encourage students to write narratives of their New Year's celebration with a word list and differentiated writing paper. Engage students while reading by interacting with retelling props. Bring the story to life by simply gluing pieces to a tongue depressor. Or, you can simply place the cards in a pocket chart for additional sequencing practice. Last, you'll find an developing reader to provide students with fluency practice using both sight words and vocabulary! Little Squirrel, Little Squirrel What Do You See? is sure to captivate students!